My most reflective and emotional experiences have been on my journeys, accidentally discovering new friendships and inspiring individuals. It is through these encounters that I have gained an honest glimpse into how vulnerable some communities and their environment are, yet, also felt the most optimistic for change. Through their stories, I have seen how an individual can trigger the belief of others to follow, encouraging collaboration and empathy between them. As I muttered to myself on a slow moving train across Romania, I began to ponder whether a global movement of individual action could be used to tackle climate change. 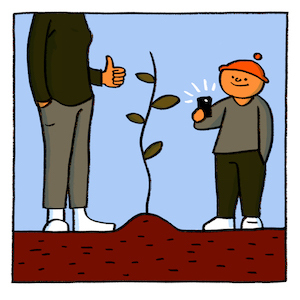 In contrast to the much needed, but long, process of overhauling our consumption-based economies, the small action of many individuals planting trees would have an immediate impact – not to mention a lot of fun getting your hands dirty! 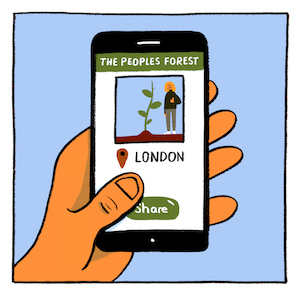 Using a mapping based app to record newly planted trees and to share efforts on social media, each individual action would sum up to create a global forest, The People’s Forest, encouraged by a sense of collective responsibility – if you happen to be an eccentric philanthropist reading this, please get in touch to launch this concept! Climate change is now at a critical stage, at a tipping point, and urgency is required. No longer can we wait for politicians to make meaningful commitments, nor trust businesses to make ethical choices. 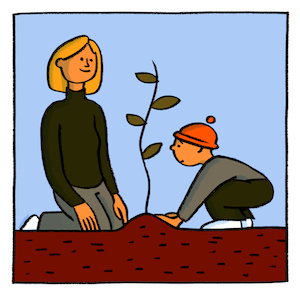 Tree planting not only absorbs CO2 from the atmosphere but also supports biodiversity, greener public spaces, and reduces flooding risk, whilst being a great tool for physical and environmental education for any ages or background. 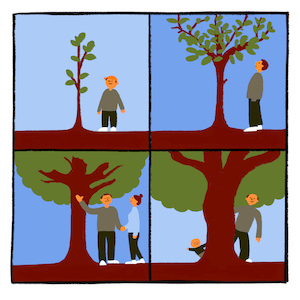 Who would not want to plant a tree for a friend, a loved one, their children, or even a stranger? 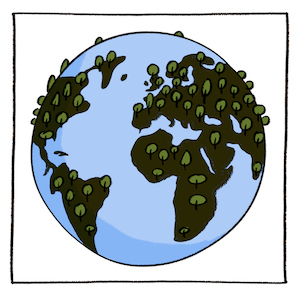 Or for a tree to be their legacy for generations to come? What more of a contribution or gift could one make that is so simple yet meaningful? It would be the greatest gift I could ever receive, that I can share with others, even with those I may never meet.